The unmistakable flavor and fragrance of fresh basil, combined with our premium Extra Virgin Chilean Arbequina Olive Oil. Perfect in pestos, caprese salads, as a sandwich dressing or over soft cheeses. 375ml/12.7 oz. 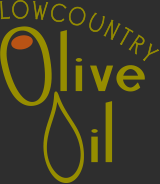 Infused in Charleston by Lowcountry Olive Oil a classic with our aged traditional balsamic of Modena or garlic infused balsamic vinegar. Understand that I love basil and I loved this product as well. Mop it up with wit a little bread. Great stuff.